For the first time this year we grew 1 peanut plant in the garden. We let the plant go and virtually forgot about it until the last weekend (first weekend in November). 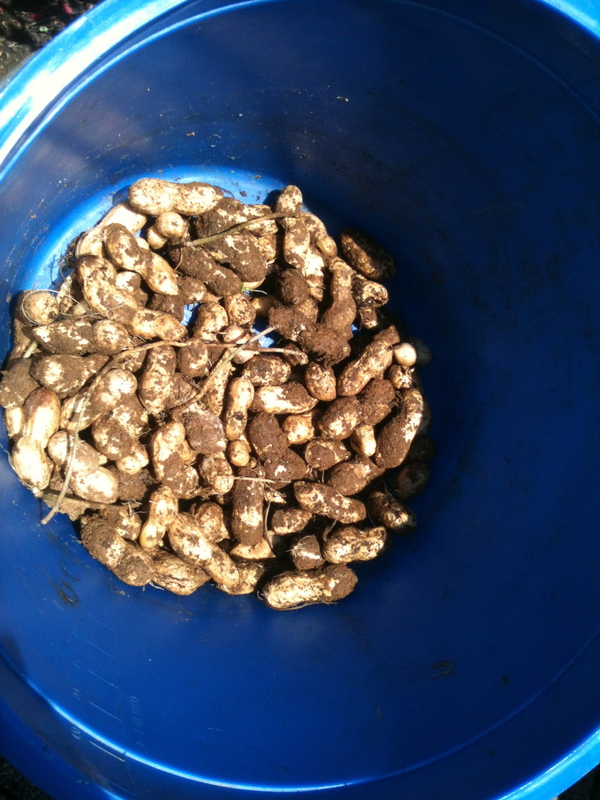 We pulled the plant to find tons of ready to pick peanuts hanging off the roots. Of course we were excited, then we wondered what the heck we were supposed to do with them. Step 1 – Clean the Raw Peanuts – I put the dirty peanuts in a bucket of hot water and washed and drained them several times to remove the dirt. 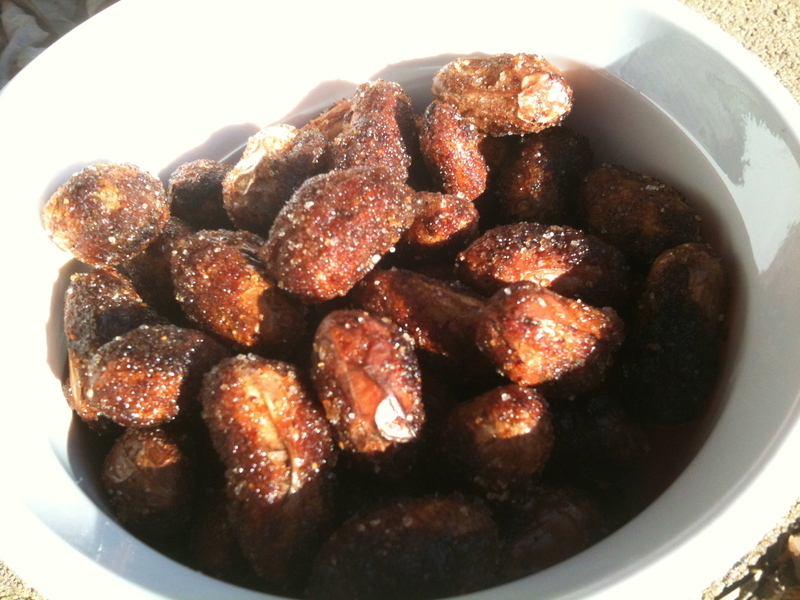 Step 2 – Dry the Peanuts – I then placed them on a window screen and put them in the sun to dry out for several hours. 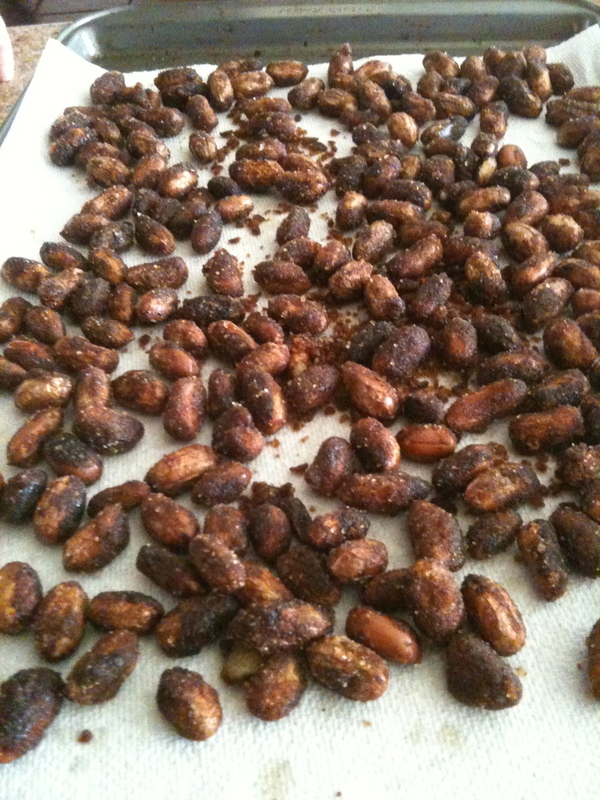 Step 3 – Roast the Raw Peanuts – Preheat the oven to 350 degrees. When the oven is preheated, place the peanuts on a baking sheet and pop them in (shells still on). Roast for 30 minutes – no more, no less – stirring every 10 minutes. Cool. 1. Preheat oven to 325 degrees F (165 degrees C). Stir together the sugar, chipotle powder, chili powder, and garlic powder in a small bowl; set aside. 2. Stir together the butter, honey, and kosher salt in a large saucepan over medium heat until the butter has melted, and the mixture is bubbly. Stir in the peanuts until well coated, then pour out into a 9×13 inch baking dish. 3. Bake in preheated oven until the nuts are golden brown, about 30 minutes. Stir the mixture 2 or 3 times to ensure even cooking. Once done, scrape the peanuts into a large metal bowl, and sprinkle with the spice mixture. Toss the peanuts to evenly coat with the spice mixture. Allow the peanuts to cool to room temperature, tossing every few minutes so the nuts do not stick together.